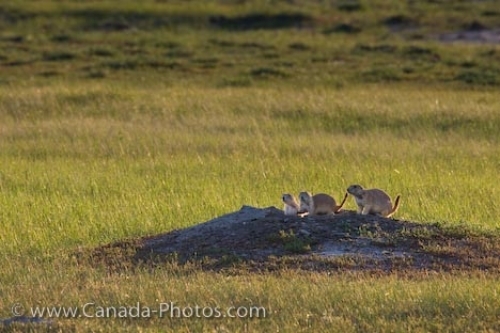 A family of Black-tailed Prairie Dogs along the Frenchman River Valley Ecotour Route in Grasslands National Park, Saskatchewan, sitting above their burrow, are just a small part of the 25 dog towns or colonies in the area. The Black-tailed Prairie Dogs which grow to be about 16 inches in length and 1-3 pounds in weight, will spend a couple hours in the early morning light to eat while the rest of the daylight hours are spent grooming, dustbathing, socializing or fixing up their burrows. The burrows prairie dogs make in Grasslands National Park, become homes for many generations. The adult male and female rebuild a new burrow, leaving the old one to their young once the babies come out and explore for themselves. Picture of Black-tailed Prairie Dogs huddled around their burrow along the Frenchman River Valley Ecotour Route in Saskatchewan. ... Dogs, Cynomys ludovicianus, in Dog Town along the Frenchman River Valley Ecotour Route in the West Block of Grasslands National Park, Saskatchewan, Canada.